Hello readers, today we’re looking at an audio community favorite: Audio Technica’s ATH-AD700. For quite some time, this headphone represented an incredible value, and is noteworthy for the respect it commands in audiophile/gaming circles. Let’s take a look and see what I think about this product! There are several ways that a headphone might be designed, but there are a couple of ways to generalize headphones: whether they are open, and what type of chassis and ear contact the headphones make. The ATH-AD700 is a dynamic open circumaural headphone. Dynamic: A type of transducer. See “moving coil” on Wikipedia for more. This is very common in production headphones. Odds are anything you’ve ever used is based on this technology. Open: the reverse of the driver is exposed to the world. Noise leaks and might disturb others around you. Consequentially, this design tends to improve head stage, and I’ve heard others say that it’s usually easier to get more sound for your buck with an open design. Circumaural: The cups, providing you’re not an elephant, will envelope your outer ear entirely. These headphones are actually quite large, enveloping my entire ear, with the bottom of the cup resting at the top of my neck and the top about a half an inch above my ear. The cups are held to your ears by tension bars (think bow flex), that start at the top of one cup, extend several inches above your head, and come back down in a graceful arc to meet the opposite cup. Most of the headphone is golden in colour, which is contrasted by a purple grille covering the reverse of the driver. 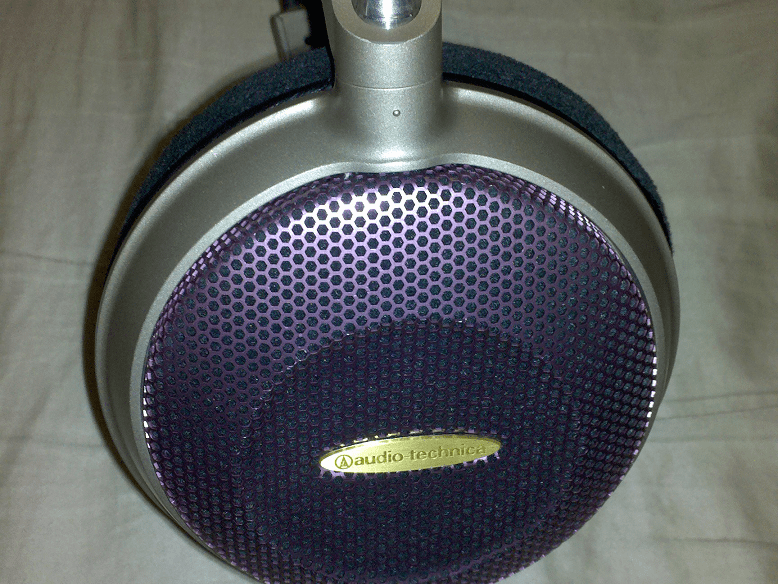 A golden badge on each of these grilles is placed directly in the center, and reads “Audio Technica”. Just above the cups, extending inward on pivoting arms are two pads, called the wings. They are responsible for most of the loose but comfortable fit of the headphone; very relaxed and secure, but if you were to wiggle or shake your head violently they may not stay put. 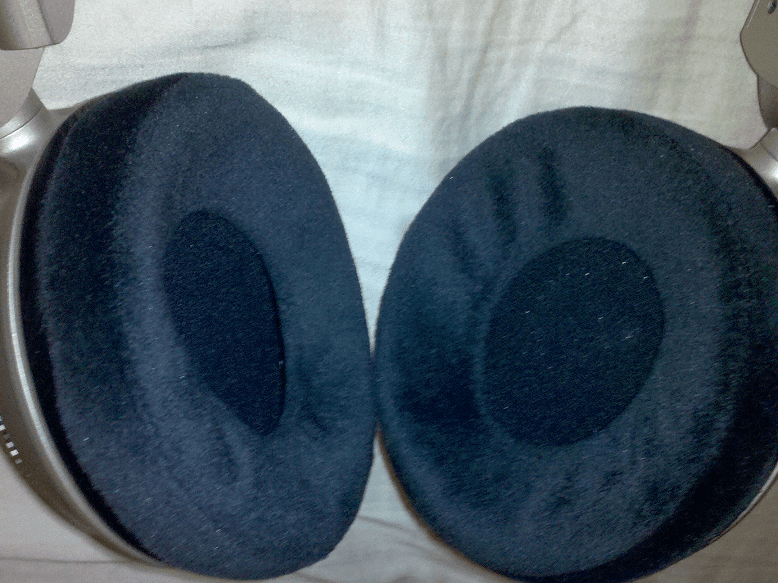 The ear pads are made of plush velour, and initially might be itchy, but after breaking them in a bit, they are quite soft. They don’t have a great deal of contact area though. In fact, I’d say it makes a contact patch (along the edge of it’s circle) of about 1 mm. 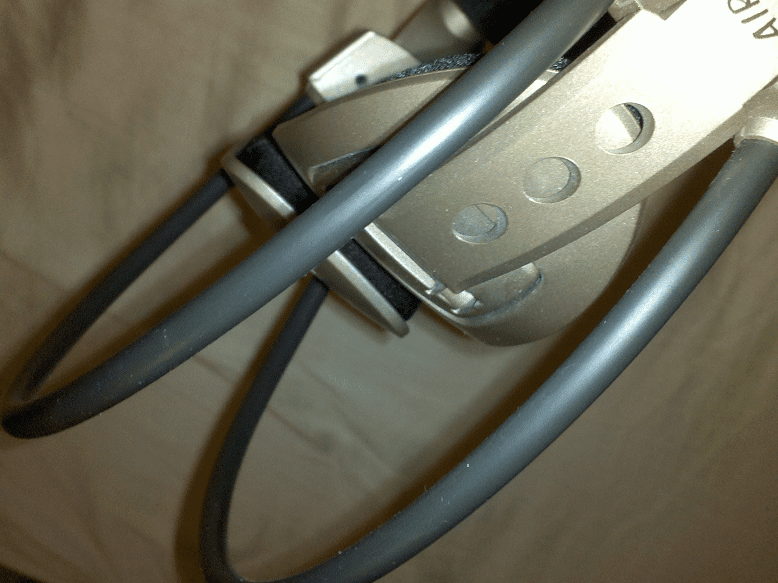 This cable is a single entry cable, which means it runs into the left cup, and then splits off internally to the right cup. The cable, while built well is far too long. It is approximately 7 feet long, and unless you need to have some sort of mobility it will only get in your way. Prepare to find ways to organize the cable around the rest of your equipment, or modify it to suit your needs. At the other end of the cable is the jack, or TRS (tip, ring, sleeve) connector. 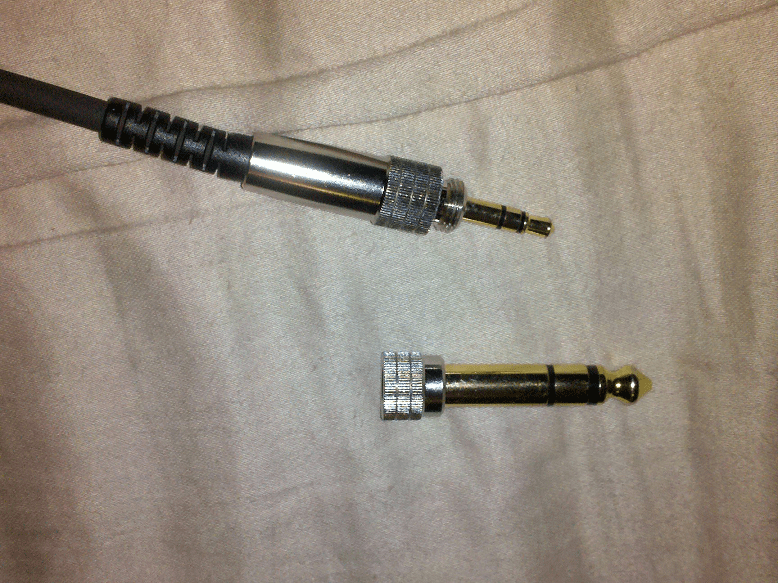 The jack can function both as a 1/4″ or 1/8″ thanks to the removable 1/4″ adapter (screw on). The design is very sturdy and looks nice. 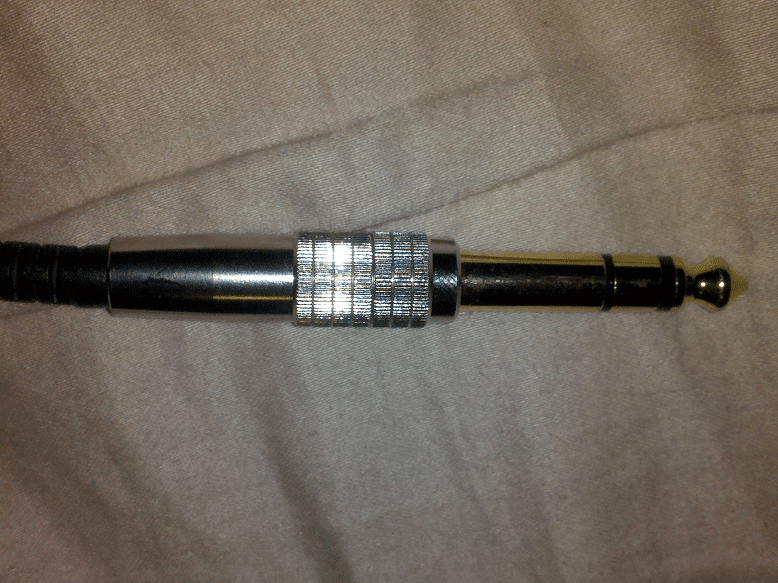 The contact area appears to be gold plated, and the body has a silver knurled portion that serves as a good grip for twisting the 1/4″ adapter off. The build quality is quite good. Sadly there is not much metal, leather or anything else super sturdy, luxurious, or comfortable to be found on them, but they are made well enough to do their job; which is give great sound while not requiring a substantial investment. The headphones will creak and moan as you reposition them, but not during listening, they stay put well and will not get in their own way. A note on amplification: These headphones have a nominal impedance of 32 ohms. This headphone sounds fine from most portable media players, or even straight from your computer. That isn’t to say that an amplifier won’t improve their sound, in fact they’re far more effortless and controlled with a well matched amplifier. Source: Creative X-FI Titanium Champion Edition. Foobar v1.0, using WASAPI plug-in. Volume is set to 100, EQ is turned off so that it’s flat. In the windows sound control, bass and treble are at 50, which is a 0 decibel gain. Amplifier: Little Dot I+, with Sylvania Gold Brand 408A and Mullard M8161 (small shields) tubes, LT1364 op-amp, and Herbie PEEK Hal-o tube dampers (size 7). The amp is stock aside from the tubes and replaced op-amp. Cables: Belkin Pure AV cables. One of the cables is a mini to dual RCA, and the other is dual RCA. Between them is a MobileSpec ground loop isolator. Content: Flac, WMA, mp3. It’s a mixture when it comes to my collection, primarily because I’m too lazy to re-rip everything. The highs are strong and well pronounced, but not overpowering. Some suggest that the highs are a strong part of why they’re so good for gaming – the highs are a really good rough indication of where things are. They are not ear piercing, but are well defined. The mids are presented with a lot of space and warmth. They are creamy, smooth and beautiful. They bring a lot of body to the sound and give you a bit more of a precise grasp on where things are. They tend to make up for what the bass lacks. The lows have presence but are not overwhelming and they never overstay their welcome. It’s not big enough to get in the way of positioning, but not lacking enough to cause me to want too much. You can hear a deep pound, but you don’t feel it unless you have these really cranked up. One of the reasons the AD-700 has been lauded over is its ability to accurately place things in space. This is called the “head-stage” by some, which is an aural illusion which simulates how we locate things by sound. For example, if we recorded the events in a room and you were there with the microphone, we’d hope that a sound that you heard to your far left in real life, would come from the same “place” when played back from the recording. Some headphones are really good at this type of aural imaging especially if the listener is trained well, and this is one of them. The sound stage is huge, and of all my headphones it seems to have the most space. In fact, while gaming I’ll hear sounds that just absolutely fool me and make me think what I’m hearing is actually in the real world. I’ll look around, realize it was from the game, and go back to what I was doing. In spite of already experiencing it many times, it never fails to fool me. The overall presentation is best described as laid back. They are just so relaxing and warm, because they are not very forward with their presentation; they’re not particularly great to listen to if you’re occupying yourself with other things, but when you dig in deep it’s all there. One of the things I like most about this headphone is their low distortion. They won’t distort until well beyond tolerable volume levels. The other side of that coin is they seem to get better at the higher end of the listenable volume range, and often times, company sitting only 4 feet from me will complain about how loud they are. This means you’ll always be tempted to bring the volume up, and this makes them a poor choice for those who share a home, because undoubtedly they’ll enjoy the music less than you. Realizing that I hadn’t very much playtime in games that demanded strong presentation of audio positioning, I fired up Unreal Tournament 3 and played through several matches on the map Defiance, and played against bots. I wasn’t particularly looking for a challenge but I did learn a few new tricks for that map. There were several times where I was able to figure out where the fighting was based on sound, but to be perfectly honest, I don’t think the game is very good at handling sound. Sound appeared to come from “that way”, or “this way”, with almost a complete disregard for walls, and other obstacles. This means you know what direction things are, but you usually can’t tell where exactly. I wouldn’t say it was a high end audio system they were using in Unreal Tournament 3. One of the most convincing and believable sound effects I heard was the Stinger fire, which appeared to have the best treble of all the weapons. Also, due to its constant firing, you could really lock onto it, as the sound never just went away. Once you grab a stinger and spool it up, you’re hesitant to relax the trigger. It’s just a fun gun to shoot, and keep shooting in game. Another note, most people who played Unreal Tournament would place you on the map not because of positional audio, but from what they heard. If you hear the sound effect for a sniper rifle pickup you know they are at the sniper rifle rack. If you hear an elevator engage, the enemy is at an elevator. So from what I can see, if you’re playing Unreal Tournament 3 a lot, sound stage is far less important than sound separation. As I said, I am pretty convinced that the game’s audio engine isn’t spectacular, so I’m moving on to another game, see you in the next section. After knocking out the first test, I moved onto something that was far less familiar territory: something I was very bad at (was, and am). 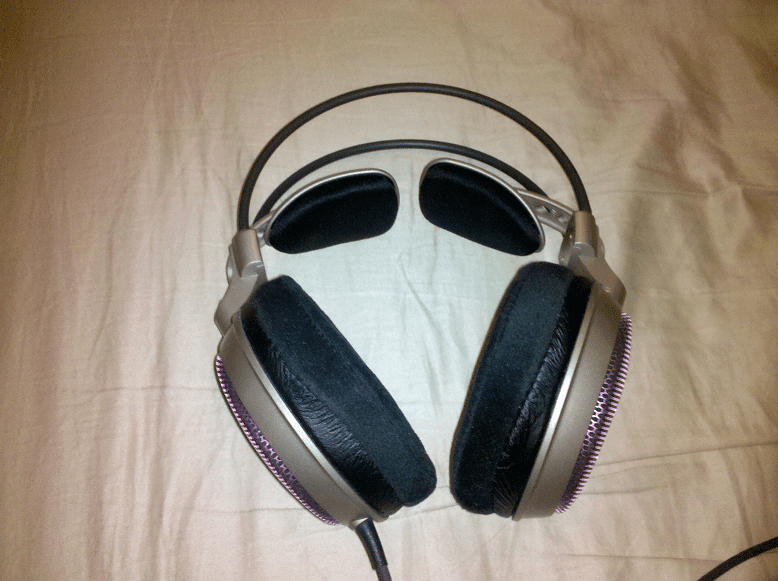 My first foray into Counter Strike: Source in a few years, and strictly to test these headphones. I have never gotten the tactical/strategic shooter genre. I’ve always been better or at least more at home in more hectic/speedy type games like Unreal and Quake. I did find that the audio engine in CS:S was a lot better, as it heeded obstacles, and sounded a lot more realistic. The plinks as bullets hit the walls could be placed to a wall, and you could then locate where the bullet originated with some fast logic (not all weapons were perfectly audible, due to silencers). Placement was typically good, not super spot on like I’m sure some headphones can provide, but it was good. Gun shots were loud and reverberated into the air and could be heard from most places. You could place gunfights into specific rooms based on what you heard. Unfortunately, there was always so much going on that it was hard to figure out where things were or what was going on. Gunfire was everywhere, and no matter where I turned I was sure to die. Audio placement was good, and I can’t complain about the headphones. I still hate Counter Strike though. Here I will listen to a few of my favourite songs and simply comment on what I hear. I select songs that specifically appeal to me and seem to be noteworthy in some way. I will also include in brackets, the file type it was encoded to. To my left and back is a guy making sounds with his mouth to the beat, the singer is near him, but more centered (to the beat boxer’s right, behind me). The drummer is back and left, and you can almost place his drums individually as you can tell they’re coming from different places; I could swear he has two snares, to his left and right and when striking them both it’s absolutely head filling. His drum set sounds huge. The guitarist is to the right, and is playing an electric. The whole song has a reggae sort of sound to it. This song places you on stage, and facing the crowd, with the band behind you. The bass is warm and smooth but doesn’t extend as deeply as I’d like. I know from listening to other cans that this track has that sub punch that would make your car rattle. You can hear that same pound, but it just stops at a certain depth. You could say controlled, but it definitely hurts the emotion a bit. Tip’s voice is definitely post processed. The beat is pretty easy to follow wearing these, and not intrusive. The vocals: beautiful, sublime, euphoric, just as they should be. After the intro, the beat comes in filled with powerful bass hits, mids beautifully carrying you into the nether, and highs chirping right along with it; they carry the beat, and the sub slam reinforces it. But that sub slam again just isn’t there. These cans let you know where it should be, but it just doesn’t extend deep enough at safe listening volumes. I think this is what people mean when they say the bass is lacking. This is sung in French, but it’s beautiful without even knowing what it means. The mids are triumphant, and the vocals are sad and remorseful. The beat is upbeat, and catchy. Such a mix of emotion in one track, the female voice that comes in on occasion almost sounds sad and agonized, but beautiful and pure at the same time. Violins to my right only a few feet off, xylophone behind me and near. The beat is synthetic, and I’m unable to place it. You can hear rain off to your right at each refrain. This track actually benefits from the lack of bass, as there is so much subtlety that it might detract from it. One thing I’ll bring up, is that this headphone is very forgiving of bad source material. You Tube videos have the capacity to sound almost as good as a flac file with these and are not super revealing of great or poor sources. The mp3’s I reviewed sounded as good as anything else I listen to with these, seeming to lack nothing (though, mathematically we know it’s lacking). This can is actually quite wonderful for gaming, especially long sessions. The open nature and velour pads don’t stifle your ears, and can sit on your head for hours without problem. 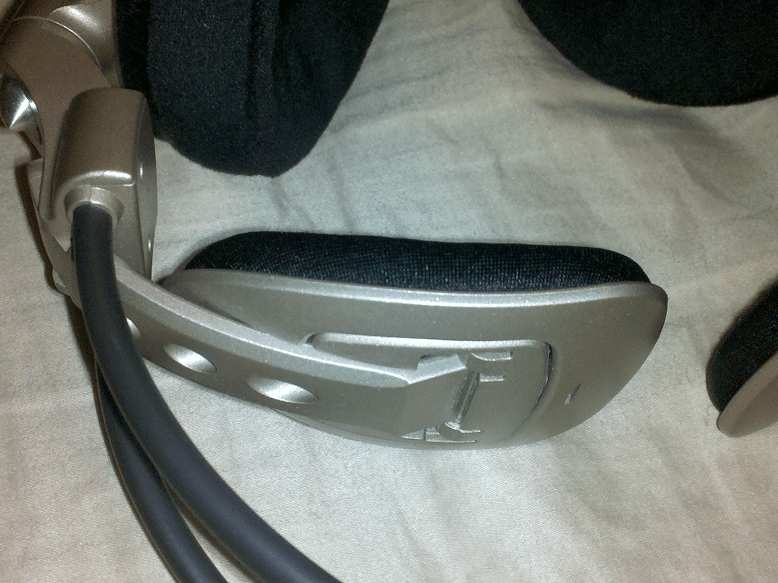 The bass is subdued, and allows for better analytical listening but this may not be what you’re wanting in a headphone. In spite of the lackluster bass, I’m very happy with these, and they are always a good resting point for me when I am tired of wearing less comfortable cans. In regards to my grading, while I do favor these cans, they are not perfect, and I will do my best to point out any and all flaws I know of. 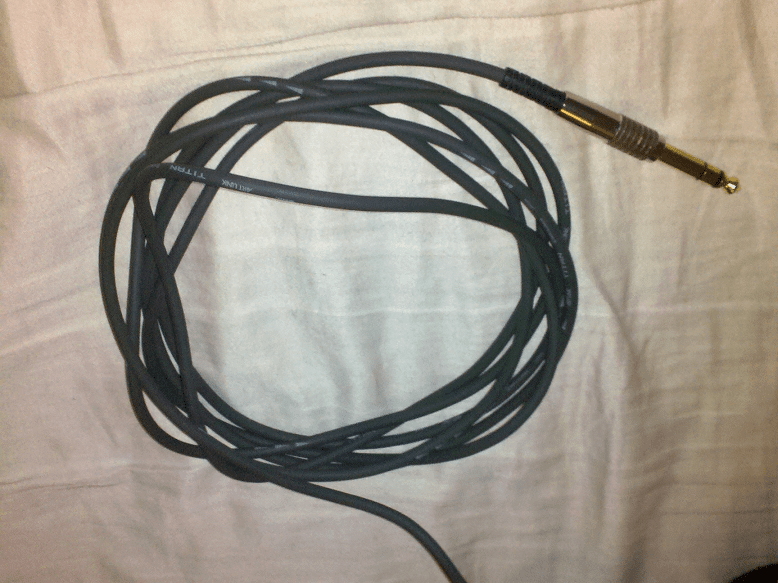 I don’t want to be that guy who didn’t tell you about the lackluster bass, loose fit, or the obscenely long cable. The ATH-AD700 has great performance per dollar, and will not disappoint those who haven’t heard even more amazing headphones. At 85 to 110 dollars (typical “good” pricing on this product), it will out sound stage anything in it’s class, and will sound better than most other headphones out there. They get really loud, and can sound good with just about anything, aside from music that requires the heavy hitting bass. At it’s price point, we can assume that the typical buyer of this product won’t be massively invested in high fidelity, and will be pleased by the forgiving nature of the headphone. These headphones perform well where they are welcome, but they are very selective of what you listen to. Hip Hop will not sound good, and heavy metal will not sound right due to an imbalance in the bass (mids and highs will shriek). Comfortable relaxed music is where this thing shines, not to mention gaming. Being the biggest headphone I have, and inexplicably having the longest cable, it makes using these for anything other than at home too troublesome. While the construction is good, it is not good enough to withstand repeated packing and unpacking.These will be hard to store at home, I have thumb tacks in my wall and hang them off those. Also, they do not fold up so you’ll have to store them in all their girth. Who should buy the Audio Technica ATH-AD700? First off, as said countless times, gamers. The strong head stage, and subdued bass means that you’ll have no trouble at all figuring out where your foes are. This makes a wonderful gaming headset. Music wise, I’ve found softer smoother music to have a better presentation on these cans. For example: Lifehouse, Jose Gonzalez, Sneaker Pimps, Etc. If you don’t require deep bass, and prefer mid heavy music (anything with an acoustic guitar, piano, or synthesizers), then you’re going to be at home with these. For such applications, this headphone will always come very highly recommended by me. Keep in mind though, there are better, but if you like what you’re seeing in this review and simply want more, then just climb up the product ladder at Audio Technica. I will say this, though: The ATH-AD700 is a great place to start. Next Article Free Water Cooling...Or Marketing Gimmick? Or Both? Great review, I've been looking to buy these and get a Zalman clip-on mic. Nice to see there's already two reviews on this site for these cans already. Yeah, Im still undecided of which way I will ultimately go, but this review helps. My biggest issue is the look, and the fact I already have a gaming headset that is said to have a plenty adequate soundstage. Being that the AD700's main selling point is ss, I'm not sure it would be a huge upgrade. Because what my headset lacks, is bass, and these are likely not going to be a huge step forward. I don't want huge bass at all, but competent bass. If something explodes in COD, I want to experience that. Whereas with my headset, it has no depth, and sounds "glassy". But back to the look, I happen to dislike the pairing of gold and purple a whole lot. I just don't understand how you come to that conclusion when designing those things. I have no issue owning something perfectly ugly, if it's performance is a reason to own it. But these this would annoy me. It is these, or the Shure SRH440. I'm sorry if I didn't define the bass well enough. You HEAR a thump, but you don't feel a thump. That may seem plain but it is simply the best way to describe the bass output on the ATH-AD700. The sound stage will beat anything else out there, especially gaming headsets. The mids will be better than almost anything you've ever heard, and the highs are well balanced. I'm sure it would be an upgrade, because the headset I have is said to have no bass whatsoever, in a review that actually compared the AD700 to them. I just hate buying things like this on the i-net. It's like clothes, never works out well for me. I've read they have less sound stage than the ATH-AD700, but make up for it with more sound. I am not sure I'd be willing to trade away one of the hugest selling points of the headphone. Ah, been waiting a while for this review, well done. I might have found something that can outpreform them for about 2/3rds of the price, though. I really need to look into it, but at the very least they are crazy close to the AD700s as far as SQ goes. The AD700s are still fantastic though. I use mine every day, which can't be said of my MS1s. I had a chance to hear the AD700, AD900, AD2000, and the Shure SRH 440/840 yesterday. For the price, the AD700 is phenomenal. The AD900 is slightly better, deeper bass. I really dont know what to think about the AD2000. At $500, I feel they should be at least $100 less. Not enough there to justify going with them over the AD900 that can be found for $250. Clear winner for me is the AD900 because of the more competent lows. Everything the AD700 is for gaming, but in my mind, the true jack of all trades because of the richer bass. By no means a bass head HP, but plenty competent. Great all around HP. On an amp they sound like they could be pushed far. Just what I was looking for. But then I tried the SRH840, and decided to ultimately go with those due to price, which I found for $140. At that price, they are a steal. They are decidedly more lively than the SRH440, which is more neutral. And definitely more lively than the AD700/900. Bass is very competent, really pleasing once amped, but not overwhelming at all. Sound/head stage is really pretty amazing for a closed HP. Plenty adequate for gaming, and the rich bass doesn't overwhelm that. Comfort is adequate, but not as good the the Audio Technica's. There might be some fatigue after 3-4 hours due to clamping if you have a big head. But overall the cups/pads themselves are just great. A kind of memory foam feeling. Very solid feeling. The band can be bent all manner of ways. Great build quality. Given that I live in the area where Shure is located so RMA is never an issue, 2-yr warranty, the detachable/replaceable cord and cups, portability, I went with the Shure's. Very happy. Possibly those G2As I picked up. The only thing about them is they are picky about source and amplification. Out of my Nuforce, they sound way too bright, but from my fuze and a fiio E5 they sound stellar. I got a fiio E3 with them and I want to try and fix it, since it happens to work well with the G2As. I think either something on the board is loose or there is a break internally, either way I have to bend the PCB to get it to work. At the very least, the combo of the G2A and E5 preforms right with the AD700. In fact, from what comparisons I've already done I can say that they outperform the AD700 with electronic music. The G2As just have this extra level of detail near the upper mids that makes synths sound delicious, the AD700s can't match it with or without the E5. Problem is, that doesn't meet the description of 1/3 the price. Normally at 85$, the G2a's are 50$. And I don't trust fiio products... they don't make enough positive impact to be worth anything as far as I can see. Noise increase on a FiiO E5 is too much to be worth the negligible gain it might ever offer. Yeah that's what I thought back when I bought the E5, but I think they do get along well with the G2As. The thing about the E3 is, you get one free with the G2As. Oh, and I said 2/3rds of the price, not 1/3. But if that is the case, my KSC75's might improve with the E5. I'll test this out tomorrow. Did some more listening last night, I'd say that dynamics aside the best thing the G2As get from the E5 is the bass boost. Without it the G2As are more bass anemic than the AD700s, but with it everything evens out nicely. I didn't notice any noise issues from the amp, I'll keep an ear out for those today. The G2As definitely sound different than the KSC 75s/portapros, at least from my memory. I distinctly remember them having gobs of bass, and that's definitely not the case here. Hey you think we should stop posting this here? Seems like the wrong place to do it.